1. Put the butter in a mixing bowl and beat well with a wooden spoon until pale and fluffy – about 2-3 minutes. Beat in the sugar for another minute, then briefl y beat in the vanilla and lemon zest. 2. Sift in both flours and the salt, then beat into the mixture until just combined (it might be quite crumbly); stir in the blueberries. Bring the mixture together with your hands and shape into a flat disc. 3. Roll out between 2 sheets of baking parchment to about 0.3cm thick; chill for 30 minutes. Preheat the oven to 180˚C, gas mark 4. Peel off the top layer of parchment and stamp out rounds using a 5-6cm fluted biscuit cutter. Lay, well spaced out, on parchment-lined baking trays. 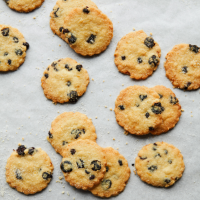 Rice flour helps to give shortbread its crumbliness (also known as ‘shortness’). If you don’t have any, you can just use plain flour instead.